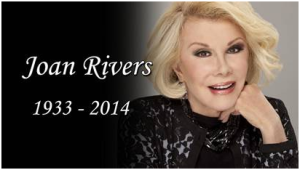 The family of comedian Joan Rivers has settled a medical malpractice lawsuit for River’s wrongful death that occurred on September 4, 2014. Investigation revealed several errors in the care of Rivers including lack of informed consent, improper administration of sedation medication and doctors snapping a “selfie” with Rivers while she was unconscious. Rivers sought treatment from an outpatient clinic in the Upper West Side of Manhattan where she agreed to undergo an endoscopy – a procedure where a doctor inserts a flexible camera down the patient’s throat to view images of the digestive tract. While typically considered a screening procedure with low risk of complication, Rivers ultimately died from anoxic encephalopathy (death of brain tissue from lack of oxygen) when doctors failed to appreciate and act upon signs that her breathing was compromised. A contributing factor was that doctors performed a second procedure on Rivers’ vocal chords, known as a laryngoscopy, without first obtaining patient consent. One anesthesiologist present expressed concern about Rivers’ ability to breathe if she additionally underwent the laryngoscopy but the lawsuit claimed these concerns were dismissed as being “paranoid” by the gastroenterologist performing the endoscopy. Ultimately, the lawsuit alleged doctors failed to act while Rivers’ vital signs began failing and Rivers’ was losing oxygen to her brain. Melissa Rivers, Joan Rivers’ daughter, said the settlement allows provides some closure on the legal aspects of her mother’s death and help to “ensure that those culpable for her death have accepted responsibility.” A spokesperson for the clinic said the settlement was agreeable to help avoid protracted litigation. While the amount of the settlement has not been disclosed, the attorney for the Rivers family has emphasized the importance of improving patient care and the remembering the legacy of Joan Rivers.